What a great weekend. Our kids were in town for a nephew’s graduation. Lots of sunshine, walking, talking, card playing, too much eating, and even a few pots were made. Catching up on my emails this morning, I read one of Tom Edward’s blog posts. Tom and I have an interesting friendship. I became acquainted with his work from a potter friend. 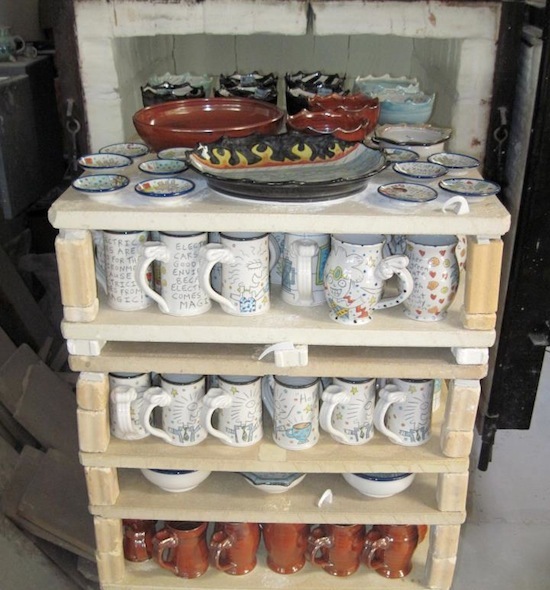 When, I opened the gallery, I thought his work would be a nice addition to our selection of handmade pottery. Wallyware makes people laugh! We have too much negativity in our world. When I was looking at colleges for our daughter, Tom suggested that we look at the University of Puget Sound. His daughter attended there and loved it. This past week, this same daughter wrote an article about her father in a Denver blog. I didn’t know that Tom was recognized as the OJ Simpson Trial Potter or that he had won a year’s supply of Ben and Jerry’s ice cream. Our kids were raised in Vermont and we know that company very well. When Ben Cohen organized that competition, I was involved with Vermont Clay Studio. I think several of our potters considered sending work to Ben. As usual our world can be very small. Happy Father’s Day, Tom.